Plumb Crazy, Inc., a family owned and operated plumbing company, is owned by Scott and Jessica Smith. Scott has been in the home service business since 1990 starting ST Enterprises just after graduating HS. In 1998, Scott decided to change directions and go into the plumbing field. 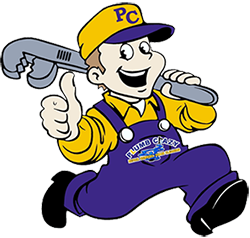 In 2002, Scott and Jessica launched Plumb Crazy, Inc.
Plumb Crazy, Inc., focuses its attention in the Loudoun County area including Leesburg, Sterling, Ashburn, Purcellville, and Dulles, keeping the company close to home so we can give Fast, Reliable, 24 Hour Plumbing Service. Plumbing when you need it most. Plumb Crazy specializes in residential. Whether you need help from Jessica in the office or Scott out in the field, both of us are here to help with whatever plumbing issues you might have. We look forward to hearing from you!